Acting on a tip off district Forest officers mobile squad led by PSI K S Kocheri raided a house at Vannur village in Bailhongal taluk and recovered three owls from them on Monday noon. 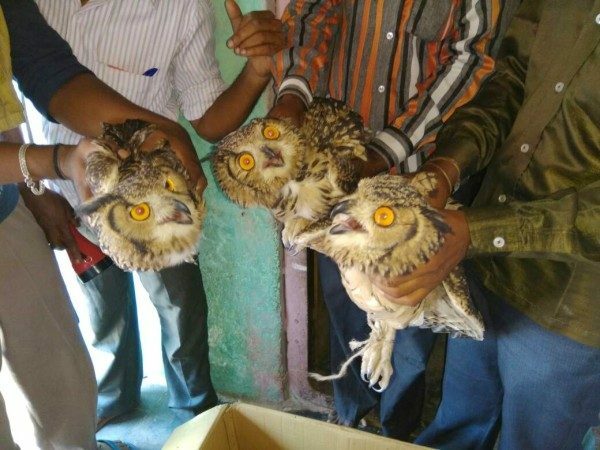 The suspect Chandrappa Mallappa Mirji of the same village is believed to catch and sell these endangered owls for black magic practices. The forest officials along with police raided the house but Chandrappa succeeded in escaping from the village during the raid. However they have found three owls in his house. I guess magic did not help the guy avoid the police. Goes to show the value of black magic.